In 2010 Mexico will celebrate 200 years of Independence (1810) from the Spanish Crown and 100 years since the Revolution of 1910 that toppled dictator Porfirio Diaz. The official countdown for the two Centennials began on September 16th of this year. The Bicentennial of Mexican Independence (Día de La Independencia) will be celebrated on September 16th and the Centennial of The Mexican Revolution (La Revolucíon Mexicana) on November 20th. This past spring President Felipe Calderón laid the cornerstore for El Arco del Bicentenario (Bicentennial Arch) on the Paseo de la Reforma (Mexico's equivalent of Les Champs Élysées) that will conmemorate two hundred years of Independence. 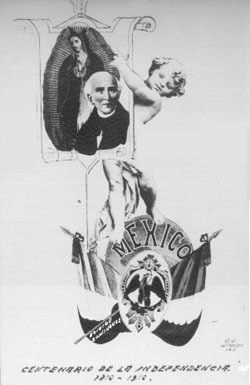 Similarly, to celebrate the first 100 years of Mexican Independence, Porfirio Diaz in 1910 inaugurated the Columna de la Independencia (better know as the Angel de la Independencia) on the same avenue. Porfirio Díaz, from Military Hero to Dictator.